These professional-quality sheets and boards from Strathmore offer true wet and dry media performance. The surface is internally sized to accept wet media yet features a durable vellum finish for traditional drawing techniques. Available in a standard size as well as popular sizes for ready-made frames and mats, these boards are excellent for both fine art and illustration. Clear plastic packaging protects the boards from damage. 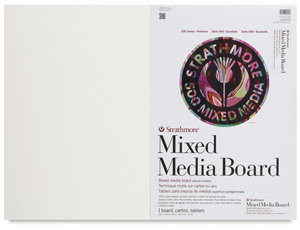 500 Series Mixed Media Boards, Pkg of 1, 22" × 30"